Layout of an PnglPL assay plate with examples of controls and pre-hit compound. Adapted from Figure 3 of Portillo Rodriguez et al. An automated drug screening approach gives insight into rare NGLY1 deficiency. Sometimes, diagnosing and treating an illness is straightforward. Other times, the diagnosis is challenging while the treatment is simple—or vice versa. In the case of a rare disease like NGLY1 Deficiency, both diagnosis and treatment can feel unreachable. The complex challenges of rare diseases prompt outside-the-box approaches—such as the partnership between a rare disease funding body and a fundamental research group. In an article published in G3, Portillo Rodriguez et al. report findings from just such a partnership, outlining a drug screening methodology used to shed light on this rare disease. N-glycanase 1 (NGLY1) is an enzyme responsible for cleaving sugars from proteins as part of the endoplasmic reticulum-associated degradation (ERAD) pathway, which oversees the breakdown of misfolded proteins. In humans, lack of NGLY1 leads to a condition that baffled clinicians and evaded identification until just a few years ago. NGLY1 Deficiency causes global developmental delay, seizures, floppy body, and an inability to produce tears; fewer than 50 patients with the condition have ever been identified, making research on treatments extremely difficult. Funding for rare disease research can be hard to come by through standard mechanisms—with so few people affected, scarce research funds are rarely diverted their way. When their daughter Grace was diagnosed with NGLY1 Deficiency, Matt and Kristen Wilsey started the Grace Science Foundation, dedicated to finding a cure for the disease and others like it. In 2017, Grace Science partnered with Perlara, a biotech public benefit corporation (bioPBC) that uses model organisms to discover treatments for rare disease. Their goal is to use high-throughput methodologies in model organisms to identify drugs that could impact the rare disease in question. The report by Portillo Rodriguez et al. is the first publication to come out of this NGLY1 partnership. The researchers developed an assay that let them efficiently screen a collection of 2,650 compounds for any that might modulate NGLY1-related phenotypes. They first generated a new Drosophila model of NGLY1 Deficiency by introducing a nonsense mutation into Pngl, the fly homolog of NGLY1; this model has a readily identifiable larval size phenotype, which let them perform their screen in 96-well plates with three larvae per well. 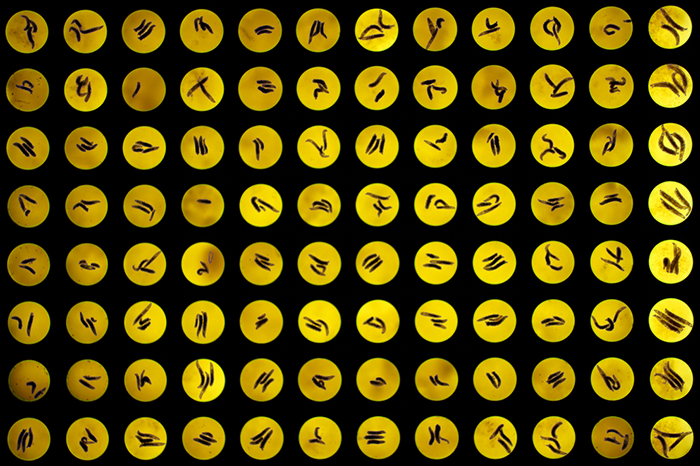 Each well contained a different drug from the Microsource Spectrum compound library; an automated workflow imaged the plates and quantified the size of the larvae to determine which, if any, of the chemicals modified the mutant phenotype. The screen produced a single validated hit: 20-hydroxyecdysone (20E), which is an important signaling hormone that drives metamorphosis and molting in arthropods. While 20E is not a good drug candidate for human patients, the implication of the neuroendocrine axis in the pathophysiology of the Drosophila phenotype gives us more information into the mechanism of NGLY1/Pngl than we previously had. Anything we can learn about the molecular players that contribute to rare disease brings us closer to finding interventions for patients—as does the availability of a validated screening platform. Because model organisms like Drosophila are so amenable to high-throughput screening of whole organism phenotypes, the hope is that approaches like these will bring people with rare diseases one step closer to treatments.